Rock 'n Roll baby onesies one piece infant outfits featuring the names, logos, and artwork from your favorite Rock bands and artists. 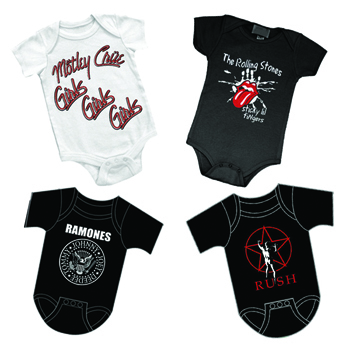 Find the cool, hip baby clothes and gear for your favorite little rockers here! This Slayer baby one piece outfit features the thrash metal's band logo of the group's name in the center of an eagle. The perfect addition to your future headbanger's wardrobe, this infant suit is made 100% black cotton and has a three snap closure.